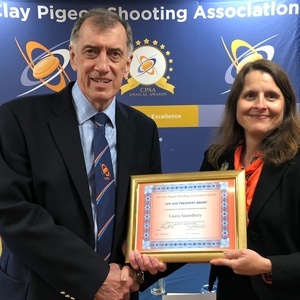 At the Clay Pigeon Shooting Association’s annual general meeting on 23rd March 2019 Laura Saunsbury was re-elected by the membership for her eleventh year as the Honorary Solicitor and Shotgun Licensing advisor to the Association. Not only that, we are proud to announce that in recognition of her service to the CPSA and its members over the last decade, the Board of Directors awarded Laura a Life Vice Presidency of the Association. This was a wonderful surprise for Laura, and a great honour indeed, when it is considered the CPSA has approximately 24,000 members and the number of Life Vice Presidents at any one time is generally around 40. Laura is shown below receiving her award from Terry Bobbett, who retired as Chairman of the Board at the AGM, and was likewise honoured by the Board with a Life Vice President Award.